Once upon a time, when I was young and naive, I watched a short 30 minute documentary. In this documentary, there was a man named Kony who was using child soldiers among other things. Eventually the video ended and called upon anyone watching to share the videos on twitter, facebook or any social media platform. So of course, young Sean said to himself “Now’s the time to make a difference”. My palms were sweaty, knees weak, arms are heavy (mom’s spaghetti?) I was shaking with anticipation, a single bead of sweat dropped from my brow as I reached forward, inhaled, and clicked share. I was an activist. I was a Clicktivist. Admittedly I did forget about the whole “Kony 2012” idea about a week later, but Kony does provide an interesting example of Clicktivism. Clicktivism is “the use of social media and other online methods to promote a cause” and in the past few years (as social media was blossoming) it has become the chosen method of protest fror tech-savvy youths. The New Political Process by Henry Jenkins describes the whole process of how “Kony 2012” became such a success and how effective social media is at spreading a message. The reason clicktivism is so effective ultimately comes down to crunching numbers. Millions and millions of people are active online, if one person on facebook ‘shares’ something, All of their friends have the potential to view this video, if two people on this persons friend list share the same item that doubles the potential views. Congruent to the process of sharing, the sheer simplicity of sharing an item with a simple click contributes to the spreadability of items. Although it may seem that the spread of these videos are viral, Jenkins points out that they are actually designed to be spread trough many people. 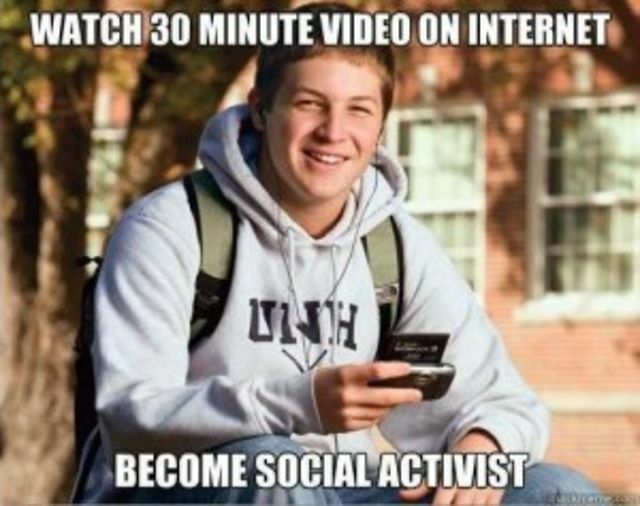 Another prime example of clicktivism is the Occupy Wall Street movement. The hashtag #OWS on twitter spread information about the movement (all though I don’t like linking wikipedia, I feel it is the best source to inform what OWS is all about). Jesse Strauss’ Youth movement in a culture of hopelessness discusses how young people are at the forefront of utilising social media to spread messages and ideas. Henry Giroux states “They [the mainstream media] certainly see them as disposable populations; young people are often defined in the United States as lazy, utterly self absorbed – it goes on and on” it can be agreed that the fact that all protesting is now is just a simple click and that they are being lazy in not actually protesting (i.e. picketing) however that minimal effort raises huge amounts of awareness for a cause. Although it is not necessarily clicktivism, it is important to note that almost all information on 3D Printing is shared on twitter. Several accounts such as @B3dge , @dimentionext and @3DPrint_News re-tweeting anything news related to 3D Printing provides extensive insight into the developments of the 3D Printing world.